* This research was supported by National Science Foundation Grant #: NSF-HSD SES-0527720. Chase-Dunn , <chriscd@ucr.edu> is the corresponding author. Abstract: This is a study of the growth and decline of cities for the purpose of identifying those events in which they significantly increased in size. Significant changes in the scale of cities are important for understanding the long-term trend toward more complex and hierarchical human societies. We report the results of an inventory of cycles, upsweeps and collapses of settlements in five separate interpolity systems. Upsweeps are instances in which the largest settlement in a world-system significantly increases in size. 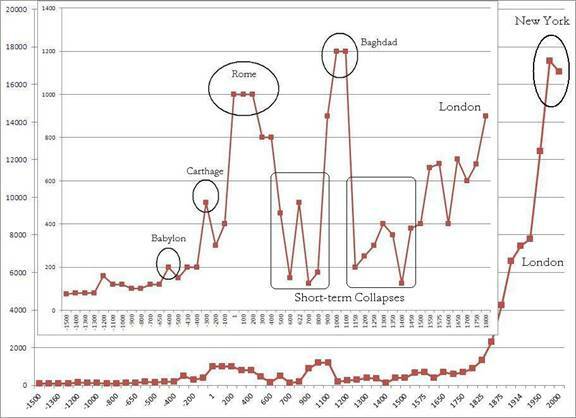 Collapses occur when the size of the largest settlement greatly decreases and stays down for a significant period of time rather than rebounding. We use regional interpolity systems (world-systems) rather than single polities or settlements as our unit of analysis. Because the accurate designation of sweeps requires interval scale measures, we are limited to those regions and time periods for which quantitative estimates of largest settlement sizes are regularly available. We find a total of eighteen upsweeps and five downsweeps, and only two instances of prolonged system-wide settlement collapse. We also investigate whether or not the rate of cycles has increased over the long run and we find that cycles of city growth and decline have not accelerated. We also find a greater rate of urban cycles in the Western (Central) system than in the East Asian system, which supports the usual notion that the Western city system was less stable than the Eastern city system. And our finding that the Central system experienced two urban collapses while the Eastern system experienced downsweeps but not collapses supports the idea of greater stability in the East. We also find that nine of the eighteen urban upsweeps we have identified were produced by semiperipheral development and eight directly followed, and were caused by, upsweeps in the territorial sizes of polities. In Figure 1 the normal cycle of growth and decline is half way down the figure and is labeled “normal growth and decline.” At the top of Figure 1 is a depiction of an upward sweep (upsweep) in which the size of the largest settlement increases significantly. 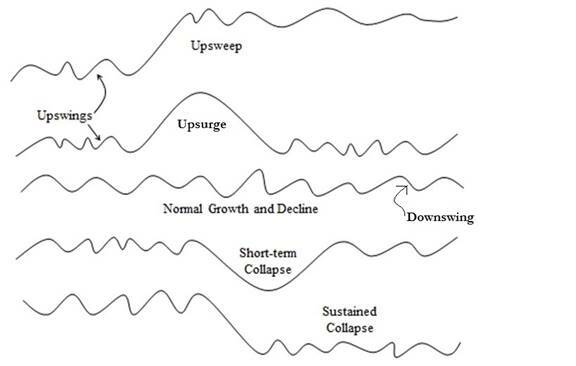 When an upward movement is sustained and a higher level of scale becomes the new normal we call this an “upward sweep” or an “upsweep.” We define an upsweep as a peak that is more than 1/3 higher than the average of the three immediately earlier peaks. We distinguish between an “upswing,” which is any upturn in a growth/decline sequence, and an upsweep, which goes to a level that is more than 1/3 higher than the average of three prior peaks. When an upsweep is temporary and returns to the old lower norm we call it an “upsurge” (see the 2nd line from the top in Figure 1). We also distinguish between four hypothetical types of decline: a “normal” downswing that is part of the normal growth and decline sequence, a downsweep in which the decline goes significantly below what had been established as the normal trough, a sustained collapse in which the new lower scale becomes the norm for at least two further cycles, and a downsurge in which a large decline is the result of the collapse of an upsurge. George Modelski’s (2003) study of the growth of cities over the past 5000 years points to a phenomenon also noticed and theorized by Roland Fletcher (1995) – cities grow and decline in size, but occasionally a single new city will attain a size that is much larger than any earlier city, and then some other cities catch up with that new larger size, but do not much exceed it. It is as if cities reach a size ceiling that it is not possible to exceed until new conditions are met that allow for that ceiling to be breached. Jared Diamond’s (2005) study of collapses specifies the factors that are thought to cause collapses (see also Tainter 1988). But Diamond does not employ quantitative measures of collapse and he often focuses on a single polity that collapsed while ignoring neighboring polities that did not. If world-systems had been his unit of analysis instead of single polities many of the cases he studied may have been found to have been instances of what we are calling normal rise and fall cycles rather than instances of system-wide collapse. We contend that true urban collapse should be defined as an instance in which all the large settlements in a region go down to at least 1/3 lower than the average of the three previous troughs and stay down for at least two cyclical periods. The research reported here uses this definition to count the instances in which settlements in regional systems collapsed. This article presents an inventory of all the instances of the types of scale change of the population sizes of settlements for all the regional interpolity networks for which we currently have enough quantitative estimates of the sizes of the largest settlements. We identify instances of each type of change, and eventually will use these as cases for testing hypotheses about the causes of upsweeps and collapses. We also use our counts of upswings, upsweeps, downswings, downsweeps and collapses to compare regions to see if there are similarities or differences across regions in terms of the numbers of cycles, upsweeps and collapses over time. There are many theories about why systems of interacting settlements experience cycles of rise and fall and upsweeps. The most general theories are functionalist evolutionary approaches that explain the long-term emergence of complexity and hierarchy by means of learning processes that produce institutions as responses to selection pressures of various kinds. Chase-Dunn and Inoue (2011) present a broad overview of theories of rise and fall, including the rise and fall of modern hegemons, and a synthetic model of the dynamics of polity growth that includes population pressures, circumscription, warfare, class struggles, and semiperipheral development. We hypothesize that upsweeps of settlement size may have been indirectly or directly caused by the phenomenon of semiperipheral development in which polities that are semiperipheral are the ones that solve the problems that make it possible to establish settlements on a larger scale. Most of these are likely to be the consequence of the actions of semiperipheral marcher states in which a recently founded polity out on the edge of a region of older core states conquers the other states and forms a core-wide empire, which then builds a large capital city. But there may have also been instances in which semiperipheral capitalist city-states or semiperipheral capitalist nation-states produce urban upsweeps (Chase-Dunn 1988). Accurate estimation of the population sizes of both contemporary and ancient settlements is a complicated problem. Daniel Pasciuti (Pasciuti 2003; Pasciuti and Chase-Dunn 2003) has proposed a measurement error model for estimating the sizes of settlements based on the literature in archaeology, demography and urban geography. We define settlements as a spatially contiguous built-up area. This is the best definition for comparing the sizes of settlements across different polities and cultures because it ignores the complicated issue of governance boundaries (e.g. municipal districts, etc). But it still has some problems. Most cultures have nucleated settlements in which residential areas surround a monumental, governmental or commercial center. In such cases it is fairly easy to spatially bound a contiguous built up area based on the declining spatial density of human constructions. But other cultures space residences out rather than concentrating them near a central place (e.g. many of the settlements in the preshistoric American Southwest such as Chaco Canyon). In such cases it is necessary to choose a standard radius from the center in order to make comparisons of population sizes over time or across cultures. Ideally we would like to have a minimum temporal resolution of about every twenty-five years because we are studying middle-run growth/decline phases of polities and settlements. Archaeological evidence of the areal sizes of settlements can be used to estimate settlement sizes, but the limitation here is temporal resolution. Studies that rely on radio-carbon dating are not able to achieve a level of temporal resolution that can make the settlement growth/decline phases that we wish to study visible. They typically have an error margin of around 200 years. When temporal resolution is poorer than every 100 years we could be missing some of the cycles of growth and decline. In some regions, such as the Southwest of the United States, much finer (yearly) temporal resolution of settlement sizes is possible based on the dating of settlement construction with dendrochronology (tree rings). Thus our examination of upward sweeps of settlement size can, in principle, be extended to regions in which there are no written records. 3. Ian Morris 2013 The Measure of Civilization. Princeton, NJ: Princeton University Press. Tertius Chandler’s (1987) compendium is still the most comprehensive study of large cities, but substantial improvements were made in George Modelski’s (2003) compendium. Ian Morris also provides estimates of the largest cities in his book on measuring the development of Eastern and Western civilizations (Morris 2013). The designation of scale changes requires interval-level measurement, but a certain degree of measurement error is tolerable because we are mainly looking for large changes. After 1500 BCE there is great agreement, for the most part, about the sizes of the largest cities, so the problems are mainly with Bronze Age cities. Our approach is to use these three sources of data to choose the best estimate of the size of the largest city in each world region. When there were conflicts we gave priority to Morris because his estimates used both Modelski and Chandler as well as other sources for particular cities. When Morris did not provide an estimate we defaulted to Modelski, and when Modelski was silent we used Chandler. The main unit of analysis in this research is the world-system, understood as a set of interaction networks containing multiple polities. Thus world-systems are politically multicentric, though they differ in the extent to which power is concentrated among a set of core polities or in a hegemonic core state. We use the criterion of political-military interaction—the so-called Political/Military Network (PMN) —to bound regional world-systems. This is an interaction network of polities that are making war and allying with one another. This is what international relations scholars call an “international system.” Four world-regional PMNs (Mesopotamia, Egypt, South Asia and East Asia) and the expanding Central PMN are studied in this paper. If there were comparable quantitative estimates of the largest settlements with sufficient time resolution, other regions such as the Americas could be added, but so far these have not been located. The spatial boundaries of each of the world regional PMNs have been ascertained based on the rule of two indirect interactions from the center of the region’s heartland of settlements and polities. The Central PMN is bounded conceptually and spatially following David Wilkinson (1987). The Central System eventually comes to include Europe, Central Asia, sub-Saharan Africa, Oceania, as well as the Americas and the four world regional PMNs we are studying (see also Beaujard 2010). The Central PMN was born when the Mesopotamian and Egyptian state systems merged beginning in 1505 BCE. That network continued to expand until it encompassed the whole globe in the 19th century CE. Each region was originally a separate PMN, and all these local systems were eventually incorporated into the Central PMN. The question we ask is: how big is the largest settlement in each interpolity interaction network? So we are not really studying individual settlements, but are rather studying the largest of these in each PMN, which is understood to be a temporally variable characteristic of the whole network of militarily interacting polities. Nor are we studying changes in the settlement size distributions (the differences in size among the settlements at each time point) (but see White et al 2006). We focus on the largest settlements in each regional PMN in order to produce the inventory of sweeps. Each of the world regional PMNs is understood in world-systemic terms as including all populations that were militarily interacting with the heartland of large settlements and states. So, for example, Mesopotamia includes the Susiana Plain (in what is now Iran) and the nomadic peoples in surrounding mountains and deserts who were interacting with the Mesopotamian cities and states. East Asia includes what became China, Japan, Korea and all the sedentary and nomadic populations that interacted with these urbanized areas. Those Central and North Asian polities that conquered the East Asian heartland of cities were obviously important players in the East Asian PMN. We also want to evaluate the hypothesis that the rate of cycles may have increased over time, but in order to do that we need keep in mind that the accuracy of our data also gets better as we approach the present. An apparent increase in the frequency of cycles or upsweeps might be due to decreasing error over time rather than real change in the rates. We made some effort to improve the estimate of the size of Baghdad in 1000 CE. Morris (2013:150) did not provide an estimate of Baghdad’s size for that year, and Modelski’s compendium contains two different estimates (1,200,000 and 1,500,000). We looked for more recent studies that might be able to guide us but could not find any. In the end we chose Modelski’s lower estimate (1,200,000 see Figure 4 below) but we also note that Baghdad would be counted as an upsweep no matter whether we use the smaller or the larger estimate. The Mesopotamian region was the heartland of cities – the first place on Earth where people solved the problems of supply and social order that occur when large numbers of people try to live in close proximity with one another. Figure 2 and Table 1 show the largest known cities in Mesopotamia from 3700 to 1500 BCE (when the Mesopotamian and Egyptian PMNs merged to become the Central PMN). The vertical axis in Figure 2 shows the population sizes of largest cities in thousands, and the horizontal axis shows the years BCE. Earlier estimates of settlement sizes in the Mesopotamian PMN are available, but we start our count in 3700 BCE because it is then that the estimates become more closely spaced in time (though there is still a 300-year gap between 2800 and 2500 BCE). After 2500 BCE we have estimates every century. From the legend of Sargon, the king whose conquests created the huge Akkadian Empire, we know that a new capital city named Agade (Akkad) was built somewhere near Kish. But the exact location of Agade has not been positively identified among the tell mounds of Iraq and so there is no empirical way to estimate its size. This important missing case means that we should be reticent to draw firm conclusions regarding the timing and shape of city growth in the Mesopotamian region. Regarding the hypothesis of semiperipheral development, some archaeologists think that towns and irrigated agriculture emerged on the Susiana Plain in what is now Iran adjacent to the floodplain of the Tigris and the Euphrates before towns and irrigation emerged (on a larger scale) on the flood plain (e.g. Nissen 1988). Others see a contemporaneous emergence of settlements and irrigation in the two adjacent regions (e.g. Adams 1981). If Susiana preceded Mesopotamia then the polities and settlements in Mesopotamia might have been semiperipheral to a Susian core region. But if they developed simultaneously this is unlikely. Southern Mesopotamia may have developed large cities before Northern Mesopotamia, so the north could have been semiperipheral to the south, but the evidence regarding this is also mixed and complicated because the dating of settlement sites is uncertain (Adams 1981). Dilmun, a trading port in the Arabian/Persian Gulf, was perhaps the first semiperipheral capitalist city-state specializing in the seaborne trade between Mesopotamia and the Indus River civilization. Regarding the relationship between upsweeps in the territorial sizes of polities and urban upsweeps in Mesopotamia, we do not know how large the Uruk polity was because the territorial expansion took place before the invention of writing, and later documentary evidence is unclear about the extent of the Uruk polity. Settlement sizes can be estimated from archaeological evidence alone, but not polity sizes. The growth of the city of Uruk may have preceded the Uruk imperial expansion because it was organized as a theocracy with a temple economy, but we do not know for sure. In this case it may have been the city that produced the empire rather than the other way around. The Akkadian Empire was the first polity upsweep for which we have a good idea how large the empire was, and it was very large (Liverani 2014). Unfortunately, as mentioned above, archaeologists are still unsure as to which of the many tells on the Mesopotamian flood plain was the capital of the Akkadian empire, Agade. So we do not know whether Agade was large enough to have been an urban upsweep or not. There is a controversy over whether the Akkadian Empire should be considered a semiperipheral marcher state or not. Yoffee (1991) contends that the empire was created by an ethnic rebellion against the Sumerian ruling class by a group of Akkadian-speakers who had long lived in the Mesopotamian cities. Diakonoff (1973) mentions factors more favorable to the interpretation of the Akkadian expansion as having been a semiperipheral marcher state. The Akkadians were immigrants and they used military technologies such as a composite bow that had been imported into Mesopotamia from a peripheral region. Whether or not the Akkadian Empire was a semiperipheral marcher state, the Third Dynasty of Ur was definitely a retaking of state power by the old Sumerian ruling class, and it was this restoration of Sumerian power that produced the urban upsweep of Ur. The territorial size of the Third Dynasty of Ur was quite small compared with the gigantic Akkadian Empire, but it was a bit bigger than polities had been in Mesopotamia before the rise of the Akkadians. Thus the urban upsweep of Ur was not due to a semiperipheral marcher state. Figure 3 and Table 2 show the sizes of the largest cities in Egypt from 2500 BCE to 1500 BCE. 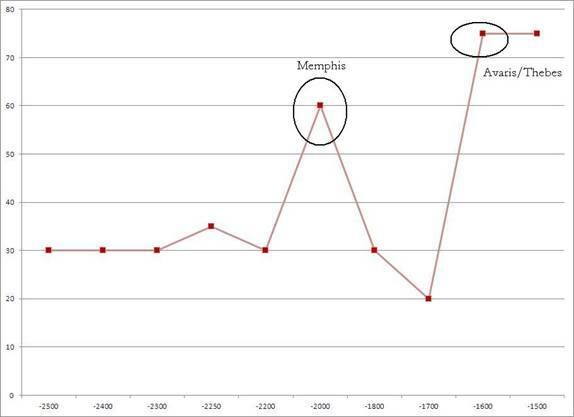 Here we see the rise of Memphis, and then the rise of Avaris, the Hyksos capital, and then of Thebes. The Memphis upsweep occurred over a succession of dynasties, peaking at 2000 BCE during the eleventh dynasty. So the count for Egypt is two urban upsweeps and three upswings. After the Memphis upsweep Memphis declined in size and Avaris, though the largest Egyptian city in 1700 BCE, was significantly smaller than cities in Egypt had been for a thousand years. This was an urban downsweep, but still not a sustained collapse because the largest city (Avaris) rapidly grew to produce the second urban upsweep. The Hyksos were immigrants who rebelled against the Egyptians and took state power. This was an instance of semiperipheral development because the ethnically distinct Hyksos were relatively recent immigrants from a non-core region. Thebes was restored as the capital and largest city after a nativist rebellion that dethroned the Hyksos and established the seventeenth Egyptian dynasty. Figure 4 and Table 3 show the sizes of the largest cities in the Central PMN from 1500 BCE (the period following the consolidation of the Egyptian and Mesopotamian PMNs into one PMN; see Endnote 15) to 2000 CE. The period up to 1800 CE is inserted into Figure 4 with a smaller vertical scale to make the earlier upsweeps more visible. There were five urban size upsweeps and 12 upswings over this 3500 year period. There were three urban downsweeps in the Central PMN over this period of 3500 years. A downsweep is counted when a trough (low point) is 1/3 lower than the average of the three previous troughs. The first two were during the centuries between the upsweeps of Rome and Baghdad. This urban short-term collapse was interrupted by the growth of Ctesiphon, the capital of the Persian Sassanid Empire, which was located on the Tigris River 30 kilometers from modern Baghdad, but Ctesiphon only attained half the size that Rome had been. The third downsweep occurred after Baghdad had been sacked by the Mongols. This was part of another urban collapse between the Baghdad upsweep and the long composite upsweep that was the product of the Ottoman Empire and rise of the West. The collapses between Rome and Baghdad and between Baghdad and London are the only two instances of urban system-wide collapse identified by our study. We call them short-term because, though the troughs were significantly lower than earlier troughs had been, these collapses did not meet the criterion of staying down for at least three cycles that we have designated for a sustained collapse. All of the urban upsweeps in the Central PMN were the outcomes of the processes of semiperipheral development. The Neo-Babylonian Empire, which expanded Babylon to 200,000 in 600 BCE, was the outcome of the defeat of the ruling Assyrians by the Chaldeans, a people originally from Southern Mesopotamia near the Persian Gulf. The rise of Carthage was due to the successful trading enterprises of the Phoenician founders of Carthage. This was an interesting and somewhat unusual example of what Chase-Dunn and Hall (1997) have termed a “semiperipheral capitalist city-state.” Carthage was unusual in two ways. It became the largest city in the Central PMN in terms of population size, whereas earlier and later semiperipheral capitalist city-states were more usually smaller cities specializing in the carrying trade between the larger capitals of territorial empires. Carthage began as a typical Phoenician city-state specializing in trade rather than conquest, but it shifted toward the territorial strategy and this may be why the city became so large (Ameling 2011). The eventual rise of London and New York were the outcomes of the rise to hegemony of modern capitalist nation-states. The urban upsweep of Rome was a semiperipheral marcher state because the Romans were originally Latin hill farmers living on the outskirts of Etruscan and Greek cities on the Italian Peninsula. Baghdad was the outcome of a process of semiperipheral marcher conquest based on late state formation and the rise of a new world religion among the Bedouins and city Arabs of the Arabian Peninsula. Regarding polity upsweeps, the Neo-Assyrian Empire was a huge upsweep in the territorial size of an empire (Inoue et al 2012), but Nineveh, its capital, though it was very large (Radnor 2014), did not constitute an urban upsweep because it was not larger than Babylon and Egyptian cities had already been (see Table 3). The subsequent Neo-Babylonian Empire was relatively small in territorial size, but produced an urban upsweep in the great population size of Babylon. Though Carthage did develop a territorial empire, it was not large compared with earlier empires but its combination of trade and conquest produced an urban population size upsweep. Alexandria was part of the composite upsweep brought to its height by Rome. The rise of Rome produced both an empire upsweep and an urban upsweep, as did the rise of Islam, though the peak size of the Abbasid territory preceded the peak in the size of Baghdad, which occurred after the rise of the Fatimid’s had reduced the size of the Abbasid territory. Islamic Baghdad grew up in the old heartland of cities on the Mesopotamian flood plain, but it was far larger than any city in that area had ever been before. The Ottoman and British Empires produced the first part of the last great composite urban upsweep, but New York was produced by a continental hegemon (the United States) that had substituted neo-colonial forms of empire for formal colonialism (Go 2011). By 2000 New York was shrinking a bit and other large cities were catching up (Tokyo, Shanghai, Mexico City, Sao Paolo, etc.) flattening the contemporary global city size distribution (Chase-Dunn and Willard 1994). Figure 5 and Table 4 show the largest East Asian cities from 1750 BCE to 1850 CE. The first upsweep is associated with the location of Zhengzhou on the southern bank of the Yellow River in what is now Henan Province. Zhengzhou is the site of Ao, an early capital of the Shang dynasty. Anyang, on the Huan River, was the site of Yin, a later Shang capital. The Shang dynasty was probably a semiperipheral marcher state that became a core state by conquering earlier large polities, including the semi-mythical Xia dynasty. The old center of Erlitou was replaced by the capital at Zhengzhou (Ao) around 1600BCE. Later, the Shang dynasty was taken over by Western Zhou dynasty in 1045 BCE, probably another semiperipheral marcher state (Shaughnessy 1999; but see Von Falkenhausen 2006) and the capital was moved to Haojing. The urban upsweeps of the two Shang capital cities of Zhengzhou and Anyang were thus apparently a consequence of Shang semiperipheral state formation. Chang’an was the Han capital located quite near modern Xian. The Western Han Dynasty produced an empire upsweep as well as an urban upsweep, but the Han Dynasty was not a semiperipheral marcher state. The Han, Tang and Song dynasties were all started by generals who rebelled against the rulers of core states and took over by coups during dynastic breakdown situations. They were not the leaders of newly established semiperipheral states on the edges of the old core region. The second upsweep of Chang'an occurred during the Tang Dynasty (618—907), which also produced an upsweep in the territorial size of empire (Inoue et al 2012). Chang’an was, along with Constantinople and Baghdad, one of the largest cities in the world at this time. Kaifeng became the capital of the Song dynasty and Hangzhou became as large as the capital during the 11th century. The Song Dynasty did not produce a polity size upsweep and it was not a semiperipheral marcher state. Thus we find six urban upsweeps and nine upswings in East Asia. We count no downsweeps in East Asia. None of the troughs were lower than earlier troughs. 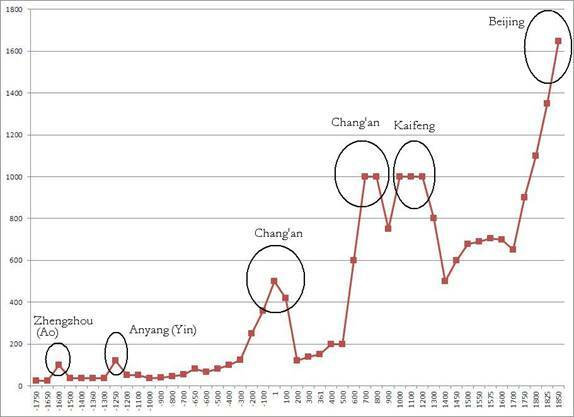 But after the decline of Yin (Anyang), the last Shang capital, city sizes were slow to recover (see Figure 5). There were no collapses in East Asia because the troughs were not lower than earlier troughs had been. Figure 6 and Table 5 show the sizes of the largest cities in South Asia from 500 BCE to 1000 CE. Surely the first South Asian urban upsweep occurred with the rise of the Indus valley civilization cities of Harappa and Mohenjo-Daro in the Bronze Age. We know how large these Bronze Age cities were at their peak, but we do not have temporally regular estimates of settlement sizes until large cities had emerged in the valley of Ganges. We begin our count of upsweeps as soon as we have size estimates every 100 years, in 500 BCE. The first and only South Asian urban upsweep in the period we are studying was that of Pataliputra (modern Patna) at the confluence of the Ganges and Gandhaka rivers. This was the capital of the great Mauryan Empire founded by Chandragupta Maurya. The city of Vaishali is believed to have been as large as Pataliputra at its peak size in 300 BCE. After the decline of the Mauryan cities there was a long period of smaller cities that corresponds with the political decentralization of South Asia after the fall of the Mauryan Empire. Eventually Angkhor arose in the region that is now Cambodia, part of the greater South Asian PMN. In Figure 6 we see one urban upsweep and five upswings. There were no downsweeps and four downswings. The steep descent after the Pataliputra upsweep was what we have termed a “downsurge.” It did not go below what had been the typical size of cities in South Asia before the growth of Pataliputra, so it was not a collapse. Chandragupta’s ascent to power seems to have followed the trajectory of a semiperipheral marcher state. His people ruled independently on the marches of a more powerful kingdom (Kosala) before being uprooted by the expanding Nanda kingdom. From there, it took only one generation for the Mauryan line to collect power, first conquering marginal territories and then overthrowing the Sudra-born Nanda rulers and replacing them with Ksatriya Mauryas (Ahmed et al 2013). Table 6: Settlement Sweeps in Five World PMNs: Formerly Semiperipheral Polity = *; Polity long in the core = #; Not sure = ? Short-term Collapse = ! Table 7 combines the results of our counts of urban upsweeps and upswings in five regional PMNs in a way that allows them to be compared with one another. We have a total of 18 upsweeps and 36 upswings adding up all the results from the five regions under study. The lengths of the time periods vary in Table 7 from 1000 years for Egypt to 3600 years for the East Asian system. So in order to compare regions we calculate the number of upsweeps and upswings per year. Regarding upsweeps per year we see that the regions vary from a low of 500 years for Egypt (two upsweeps over 1000 years) and high of 1500 years for South Asia (one upsweep over the whole 1500 year period). The upsweep rate (years per upsweep) for the Central PMN is 700, while for East Asia it is 600. Mesopotamia has 562 years per upsweep. South Asia is the outlier with only one upsweep over the whole period. We found the same result for South Asia in our study of upsweeps in the territorial sizes of empires (Inoue, et al 2012). The long interregnum between the Mauryan and Mogul Empires makes the evolutionary history of South Asia rather different from the other regions (Chase-Dunn, Manning and Hall 2000). The comparison between East Asia and the Central System is of great interest, though most of the literature discussing the rise of the West in comparison with the East focuses on Europe and China. We are comparing the Central System, which for most of the period had big cities in the old West Asian-North African core, with East Asia as a region of contending states in which China long played the central role. This overlaps with, but does not exactly replicate, the more usual comparison between Europe and China. Table 8 compares numbers and rates of downswings and downsweeps across our regional cases. Recall that a downsweep is a low point (trough) that is at least 1/3 lower than the average of the three previous troughs. One striking result in Table 8 is that there were only five downsweeps in all of our five regions, while we saw in Table 7 that there were eighteen upsweeps. So urban downsweeps are few relative to the number of upsweeps. Also we found only two short-term system-wide collapses, and both of these were in the Central System (following the upsurges of Rome and Baghdad). The Central System also had more downsweeps and more downswings than the other regions. Table A2 in the Appendix divides the total period for each PMN into five equally-sized sub-periods (phases 1-5) and counts the number of cycles, upsweeps and downsweeps for each sub-period to see if there is an acceleration of cycles or sweeps over the period of study. This analysis shows no consistent trends regarding the frequency of sweeps or cycles. 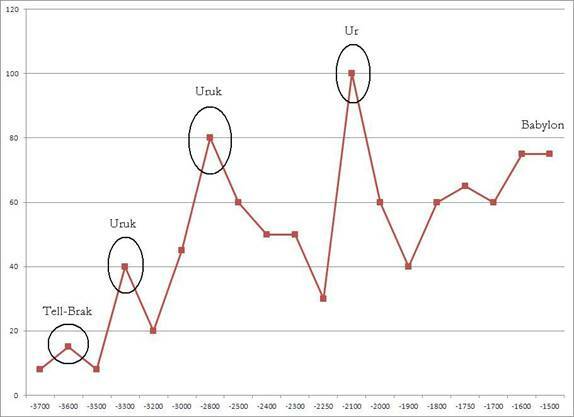 This article reports the results of an inventory of cycles, upsweeps and collapses of settlements in five separate world regions that had independent systems of fighting and allying states. Because the accurate designation of cycles and sweeps requires interval scale measures, we have confined our study to those regions and time periods for which regular quantitative estimates of largest settlement sizes are available. We found a total of eighteen upsweeps, five downsweeps, and only two instances of short-term system-wide settlement collapse (the slumps in city sizes between Rome and Baghdad and between Baghdad and London). A number of scholars have taken exception with Jared Diamond’s characterization of collapse in the places he studied (e.g. McAnany and Yoffee 2010). Our quantitative study shows that there have been only two lengthy system-wide collapses in which large cities did not recover for centuries. We also investigated whether or not the rate of cycles has increased over the long run and we found that cycles of city growth and decline have not accelerated. We found a greater rate of urban cycles and more sweeps in the Western (Central) system than in the East Asian system, which indicates that the urban system of the West was somewhat less stable than that of the East. And both of the instances of short-term urban collapse occurred in the Central System, not in the East. We also found that ten of the eighteen urban upsweeps were produced by semiperipheral development and eight directly followed, and were caused by, upsweeps in the territorial sizes of polities. The finding that semiperipheral development was an important aspect of more than half of the urban upsweeps is strong support for the claim that it is necessary to study whole world-systems in order to explain sociocultural evolution. It also implies that core-centric explanations such as the network node theory of innovation cannot completely explain the pattern of uneven development and the geographical migration of sociocultural complexity from its early locations to other formerly peripheral regions. Semiperipheral development is an important phenomenon that can only be comprehended when whole world-systems are the focus of study. Adams, Robert McCormick 1981 The Heartland of Cities: Surveys of Ancient Settlement and Land Use on the Central Floodplain of the Euphrates. World-System.” Journal of World History 21:1(March):1-43.
development," Comparative Civilizations Review, 19:29-66, Fall. Chase-Dunn, C., Susan Manning and Thomas D. Hall, 2000 "Rise and Fall: East-West Synchronicity and Indic Exceptionalism Reexamined"
Social Science History 24,4: 721-48(Winter). Chase-Dunn, C. and Hiroko Inoue. 2011. “Explanations of scale changes in settlement and polity sizes.” IROWS Working Paper # 67.
International Journal of Comparative Sociology 44, 1:433-450. Chase-Dunn C, and Alice Willard 1994 "Cities in the Central Political-Military Network Since CE 1200" Comparative Civilizations Review, 30:104-32 (Spring). Go, Julian 2011 Patterns of Empire: The British and American Empires, 1688 to the present Cambridge: Cambridge University Press. comparative inventory of upsweeps and collapses” International Journal of Comparative Sociology 53,3: 210-229. Lieberman, Victor 2003 Strange Parallels: Southeast Asia in Global Context, c. 800-1830. Volume 1: Integration on the Mainland. Liverani, Mario 2014 The Ancient Near East: History, Society and Economy. New York: Routledge. McAnany, Patricia A. and Norman Yoffee, Eds. 2010. Questioning Collapse: Human Resilience, Ecological Vulnerability and the Aftermath of Empire. ______ 2013 The Measure of Civilization. Princeton, NJ: Princeton University Press. Nissen, Hans J. 1988 The Early History of the Ancient Near East, 9000-2000 BC Chicago: University of Chicago Press. Rozman, Gilbert 1973 Urban Networks in Ching China and Tokogawa Japan. Princeton, NJ: Princeton University Press. Scheidel, Walter and Ian Morris 2009 The Dynamics of Ancient Empires: State Power from Assyria to Byzantium New York: Oxford University Press. University of Georgia, PhD dissertation. Smith, Michael E. 2005 “City size in late postclassic Mesoamerica” Journal of Urban History 31, 4: 403-434. Stein, Gil J. 1999 Rethinking World-Systems: Diasporas, Colonies and Interaction in Uruk Mesopotamia. Tucson: University of Arizona Press. Von Falkenhausen, Lothar. 2006. Chinese Society in the Age of Confucius,1000-250 BC. Los Angeles: Cotsen Institute of Archaeology, UCLA. White, D. R., Natasa Kejzar and Laurent Tambayong 2006 “Oscillatory dynamics of city-size distributions in world historical systems”. Pp. 190-225 in G. Modelski, T. Devezas and W. Thompson, (eds.) Globalization as Evolutionary Process: Modeling, Simulating, and Forecasting Global Change.. London: Routledge. The Collapse of Ancient States and Civilizations. Tucson: University of Arizona Press. _____________. 2006. Myths of the Archaic State: Evolution of the Earliest Cities, States, and Civilizations. New York: Cambridge University Press. World-systems are defined as being composed of those human settlements and polities within a region that are importantly interacting with one another (Chase-Dunn and Hall 1997; Chase-Dunn and Lerro 2014). When communication and transportation technologies were less developed world-systems were small. Settlement is a general term that includes camps, hamlets, villages, towns, cities and the great megacity urban regions that compose the contemporary global urban system. This article reports results from a research project on the growth of settlements and polities in regional world-systems since the Stone Age. The project is the Polities and Settlements Research Working Group at the Institute of Research on World-Systems at the University of California-Riverside. The project uses both quantitative estimates of the population sizes of the largest settlements in world regions as well as estimates of the territorial sizes of largest polities to study the location and timing of changes in the scale of human institutions. But this article focusses primarily on the growth and decline of cities. The project web site is at https://irows.ucr.edu/research/citemp/citemp.html . IROWS collaborates with SESHAT: The Global History Data Bank. We use the term “polity” to generally denote a spatially-bounded realm of sovereign authority such as a band, tribe, chiefdom, state or empire. Our study of polity size upsweeps is presented in Inoue et al (2012). The normal cycle roughly approximates a sine wave, although few cycles that involve the behavior of humans actually display the perfect regularity of amplitude and period found in the pure sine wave. This cutting point specifies what we mean by “significant” in a way that can be used to systematically compare widely different times and places. Studying changes in the population sizes of largest cities is a useful window on polities, but it does not capture overall changes in the population sizes of polities (studied most recently by Turchin and Nefadov (2009) a neither does it reflect important changes in the distribution of city sizes studied by many urban geographers (e.g. Rozman 1973). A thorough overview of the anthropological literature on “cycling” – the rise and fall of large chiefdoms-- is presented in David G. Anderson’s (1994) The Savannah River Chiefdoms. It is possible that the causes of upsweeps and collapses may be somewhat different from the causes of normal upswings and downswings. This topic is discussed in Chase-Dunn and Inoue (2011). Pasciuti’s measurement error model includes the following variables: Area of the City within the Wall, Built-up Urban Area of the Whole City, Total Residential Area, Total Number of Residential Hearths in the Urban Area, Total Number of Houses in the Urban Area, Total Non-Residential Area and the Total Number of Households. With tree rings it is also easy to study climate change effects on settlement growth/decline phases. Roland Fletcher (n.d. personal communication) has also gathered estimates of the sizes of important cities by reading widely about individual cities and coding all the estimates he could find. Fletcher’s data are different from the others in that he includes all the estimates he could find without editing and without collapsing estimates temporally. The others try to guess the sizes of cities at long intervals, whereas Fletcher presents the exact years to which the estimates that he has found apply. We also tried to use Fletcher’s compilations to improve our final estimates, but found that not much was gained. Fletcher’s estimates of city and empire sizes are included in the Appendix to this article. Chase-Dunn and Hall (1997) note that important interaction networks often have different spatial scales. Trade networks, especially those involving prestige goods, usually are much larger than interpolity interaction networks (PMNs) in which polities are allying and fighting. In this study we use the political/military interaction network because these are easier to empirically determine. But we acknowledge that regions that are distant from one another may be importantly interacting by means of trade well before they come into direct military/political contact with one another (see also Chase-Dunn and Jorgenson 2003). The idea of the Central System is derived from David Wilkinson’s (1987) definition of “Central Civilization.” It spatially bounds a system in terms of a set of allying and fighting polities. The Central System (or Political-Military Network) is the interpolity system that was created when the Mesopotamian and Egyptian PMNs became directly connected with one another in about 1500 BCE (see Note 13). The Central PMN expanded in waves until it came to encompass the whole Earth in the 19th century CE. Because it was an expanding system its spatial boundaries changed over time. We follow Wilkinson’s decisions about when and where the Central System expanded, and the temporal bounding of the regions we are studying also follows Wilkinson’s dating of when these regions became incorporated into the expanding Central System. The contemporary global PMN is the international system of states. The merger of the Mesopotamian and Egyptian interpolity systems began as a result of Eighteenth Dynasty Egypt’s invasions, conquests, and diplomatic relations with states of the Southwest Asian (Mesopotamian) system -- first of all Mitanni, then the Hittites, Babylon, and Assyria. The signal event was Thutmosis I’s invasion of Syria in about 1505 BCE. The fusion of the systems began then but enlarged and intensified until 1350 BCE. Thutmosis III’s many campaigns in Syria and the establishment of tributary relations, wars and peace-making under Amenhotep II, as well as the peaceful relations and alliance with Mitanni by Thutmosis IV, eventually led to Egyptian hegemony under Amenhotep III (Wilkinson pers. comm. Friday, April 15, 2011, ). The Appendix for this paper is at irows.ucr.edu/cd/appendices/setsweeps/setsweepsapp.htm It contains the city size data sets for each of the regions we are studying. Recall that a downswing and a downsweep are analogous to an upswing and an upsweep, except that they use troughs instead of peaks. Gil Stein (1999) has formulated a “distance-parity” model of core/periphery relations that focuses on the spatial fall-off of the ability of the core to project power. The effectiveness of military threats declines with distance from the center of political/military power, and so imperial core states must rely on equal exchange with peripheral peoples who are beyond the scope of intimidation. This is the same place-centric idea that Chase-Dunn and Hall (1997) used to spatially bound political/military networks. After 1850 CE the East Asian PMN was engulfed by the Central PMN. Gilbert Rozman’s (1973) informative comparison of the development of Japanese and Chinese urban systems shows that the emergence of an integrated city system with middle-sized cities performing regional functions occurred much faster but later, in Japan than it did in China, as if the Japanese were able to benefit from knowing about the Chinese experience. 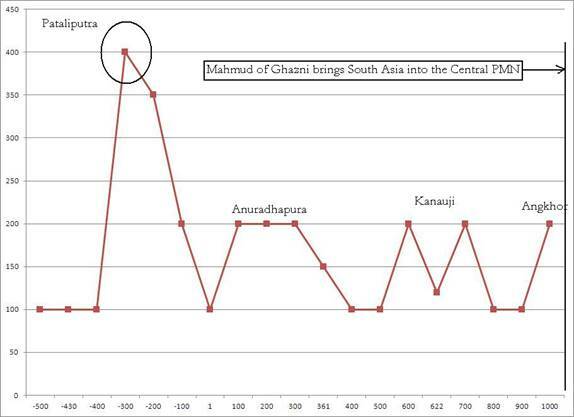 The final linking of the South Asian PMN with the Central PMN was begun by the incursion of Mahmud of Ghazni in 1008 CE. Alexander of Macedon’s earlier incursion in the 4th century BCE had been a temporary connection between the Central and the South Asian PMNs that ceased after the Greek conquest states in South Asia had been expelled. The connection was made permanent by Mahmud of Ghazni. Ian Morris (2010, 2013) also uses largest cities to indicate the regional systems he is comparing and so his discussion of East/West similarities and differences is similar in this respect with ours (see also Scheidel and Morris 2009). The average number of years per upsweep across all the five PMNs is longer for cities (772) than it is for empires (664) (see Table 1 in Inoue et al 2012). And the average number of years per upswing is quite a bit longer for the cities (329) than it is for empires (212). Empire cycles are shorter than city cycles, and empire upsweeps occur somewhat more frequently (every 634 years) than city upsweeps (772). These results imply that it takes longer to figure out how to sustain a larger city than it does to figure out how to erect a larger empire. The Appendix also contains a graph that plots both the East Asian and Central largest city sizes together (Figure A2). This graph shows that the growth/decline sequences in these two regional systems were somewhat synchronous, but that the timing of some upsweeps and downsweeps was often different in the two regional systems (see Lieberman 2003).